It is handy to have your tablet – whether it is an iPad, a Kindle Fire or something else – readily available in the kitchen. You can easily search through your favorite food blogs and browse recipes while you’re cooking. It can be difficult to find a good place to put it, however. You could prop it up against a wall or some cookbooks, or buy a stand that allows you to stand it up at an angle. But with each of these options, it can be difficult to see the screen because it isn’t at eye-level and difficult to use the touch screen the tablet, since these options aren’t exactly secure and the tablet can be easily knocked over. 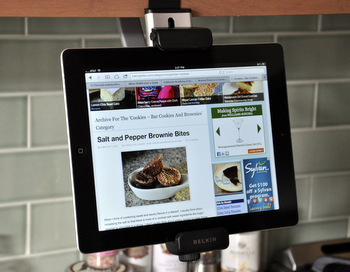 A better option is an under cabinet mount, which will hold your tablet securely at about eye level, making it easy to use and read. 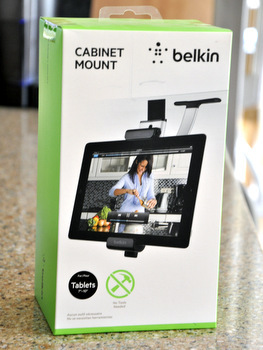 I never gave to much thought to getting and under-cabinet mount, because I didn’t want something hanging down over my counter all the time, but when I saw the Belkin Tablet Cabinet Mount, I jumped at the chance to pick one up. 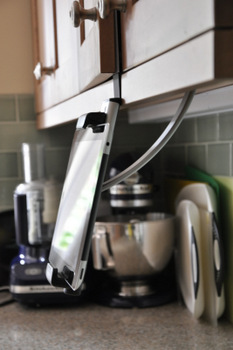 This tool is a removable cabinet mount that will allow you to secure your tablet to just about any kitchen cabinet. It has a hook that slides onto the shelf of the cabinet and an adjustable brace that comes up underneath the cabinet and secures the tablet in place. The brace has a soft, rubber coating on it so that it won’t damage the cabinetry. The piece that hangs down from the hook to the table is very thin, so your cabinet doors should be able to close fully even with the mount in place. It also adjusts to fit tablets of difference sizes and is wide enough to accommodate some cases, so you don’t need to remove your tablet from its case unless you have something pretty bulky on it. I got mine adjusted out of the packaging and adjusted in less than two minutes – and it worked even better than I thought it would. It made a huge difference to be able to see my iPad at eye level and freed up a lot of counter space. It fit on every cabinet I tried it on – including a few non-standard cabinets and found that it was still very secure and functional, though the doors didn’t quite close all the way. The mount comes in two pieces that slide together, so it can be taken down and stored flat in a drawer when it isn’t in use, which is a great feature, too. My kitchen feels more streamlined already. 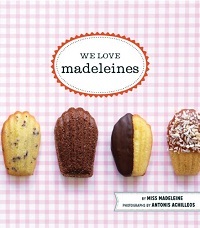 So glad I stumbled upon this – it’s perfect for my Mom’s birthday in a couple of weeks!! This is brilliant. Other mounts I’ve seen (and passed on) are permanent mounts which are a bit of an eye sore. Thanks for the thorough review. thanks for the great review.. i am planning to buy this.. but i wonder if its available in Davao City?